By Nature's Lawn and Garden, Inc.
Fall is a great time for putting down new grass seed. Anything you put down now will thicken up and become well established by the time spring rolls around. 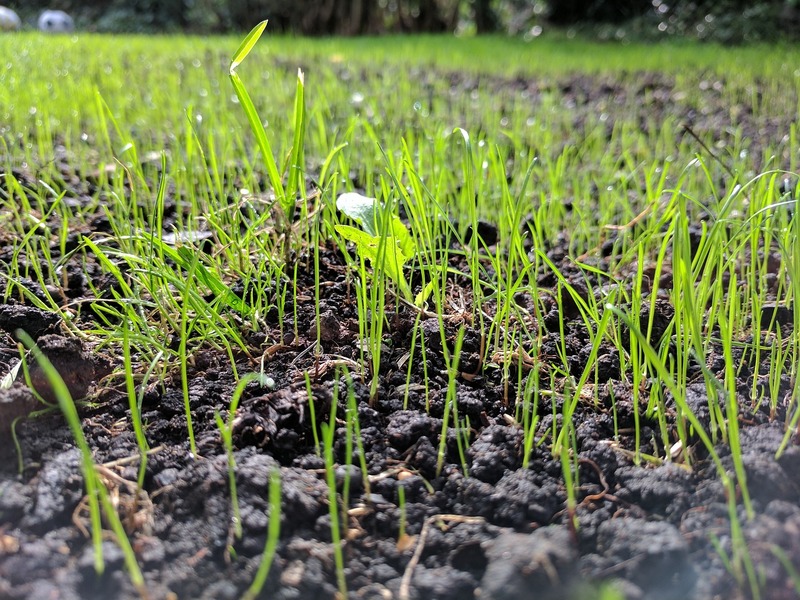 For some of you, simply overseeding will do the trick, but if you have bare spots on your lawn you may need to think about using a grass patch. Before stores and infomercials started selling grass repair, or grass patching products in a bag, groundskeepers at golf courses made up their own mixture and used it to fill in divots and bare spots. I do the same thing for my own yard and so do many landscapers. It is very quick and easy to make and use, and it allows you to put in exactly the type of seed that you want to use. Plus it is way less expensive than the products sold in stores or on infomercials. Here is all you need to do: Put a bushel or two of garden soil into a wheelbarrow. Thoroughly mix in an equal amount of compost. If you don't have compost you can use vermiculite, perlite, or sphagnum peat moss (the brown peat that comes in bales). You want to end up with a spongy, crumbly, water-holding mixture, much like a potting soil. In fact, you could use bagged potting soil instead of this mixture if you don't have the other ingredients at hand. Next, mix enough grass seed so you see plenty of seed in every handful. When spread on the lawn you want to see 15-20 seeds per sq. inch. Use a grass seed that matches what you already have in your lawn. If you don't know, bring a sample to a local nursery. If you have some starter fertilizer around put a cup or two in the batch. This is not critical if your soil is fairly healthy and regularly fertilized. You can always fertilize after the grass comes up. We recommend All-In-One for Lawns if you like using liquid fertilizers. If you are using this mixture to overseed a thin area of the lawn that does not have dead or bare spots, simply toss the mixture over the lawn wherever it is thin. If necessary, rake the lawn lightly afterwards to get the mixture to drop down off the grass blades. That's it! To get the grass seed to actually grow, however, it is critical to keep the seed damp until the grass is established. Give it a good watering to get things started. If the soil below the seed was dry, really soak it deeply. The grass patch mixture will be nice and dark when damp so it will be easy to see if and when it dries out. Depending on the time of year, and the amount of rain you get, you may need to water once or twice a day, or maybe once or twice a week. The soil should not be soggy, it just needs to be damp. Once the grass sprouts and starts to root deeper and toughen up you can gradually phase out the watering to once or twice a week, enough to keep the soil from getting too dry. Again, it depends on your local weather conditions as regards to temperature, precipitation and even wind, which dry out soils too. For an extra boost, an application of Aerify PLUS before or after the new seed is down is an excellent way to prepare the soil and encourage the seed to take.